Customer conversion is about relationships. But relationships take time. In many cases, potential customers must come into contact with your brand several times before making a buy decision. Let’s look at how Shred Spot does this. 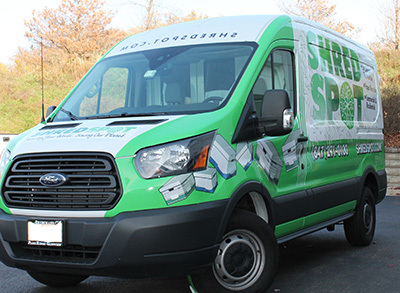 For fleet vehicle graphics in Elgin, Illinois contact us or give us a call at (630) 289-7082. We serve the entire Chicago area. Shred Spot is a paper shredding company that set up great looking fleet vehicle graphics. 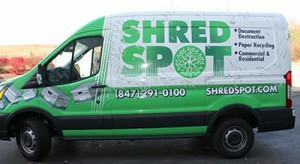 For Elgin and Northbrook and the whole Chicago area, the Shred Spot brand is highly visible on the streets. The company name is a snap to remember, and the bright green graphics are easy to spot even at a distance. The image on the back of their trucks elicits an emotional response. This makes people think twice about what they do with sensitive personal documents. The company also is dedicated to environmental improvement which is represented in the vehicle graphic design. The other nice thing about the Shred Spot name is that it’s an easy to remember web address (shredspot.com). 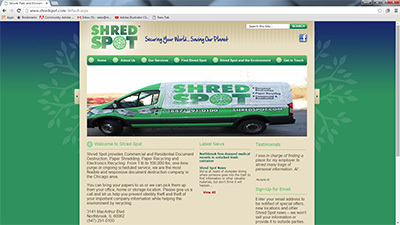 And when you visit their web page, the message and themes are consistent with their truck graphics. The company even went so far as to include an image of a fleet truck on their homepage. This is great marketing. The potential customer is taken on a journey of discovery from the street to the web, and everything links together. And it gets even better. The Shred Spot vehicles are an integral part of their business. To be shredded and recycled, paper is picked up by the bright green and white vehicles. This makes for continued brand presence in the customer’s mind. 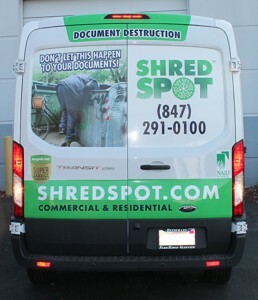 If anyone ever asks a Shred Spot customer to recommend a paper shredder service, the company name is easily reproduced. Look again at the truck graphics. In a few words they tell you what anyone needs to know about the company services. Phone number and website address are in large font while the brand logo takes center stage. This is an ideal set up that brings the brand to the front of a customer’s attention. Get great fleet vehicle graphics in Elgin, Illinois contact us or give us a call at (630) 289-7082. Serving the entire Chicago area.